I've chosen the Finalists for Character Contest 31, which challenged you to build a great weapon using HeroMachine 3. I've got quite a few of them, so follow me after the jump to see them in all their glory! I really liked Alexander's detail work here. His "Divine Sword" looks like it could be in a Final Fantasy game easily. 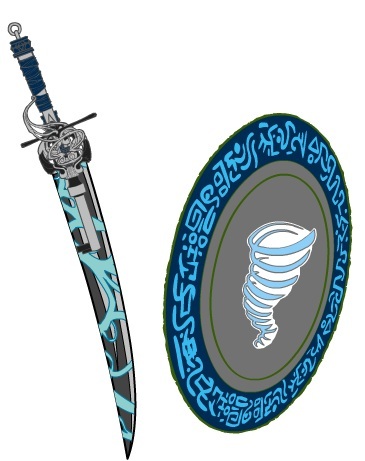 Asherian's "Wind and Wave" sword & board combination are also interesting. I liked the attempt at the inlay on the sword, although I feel like maybe it doesn't quite blend in with the blade exactly right. I love the joining of that hilt with the crossguard though, it looks fantastic. I'm not as excited by the shield, but the sword was definitely a hit. I know the app crashed on Blue Blazer before he could color "Shadowfang" but I actually think that might have been a good thing. I could see this as an illustration (maybe with sepia lines) in an RPG supplement, and I think it goes to show that you don't have to get all crazy with halos and effects to come up with an effective drawing. 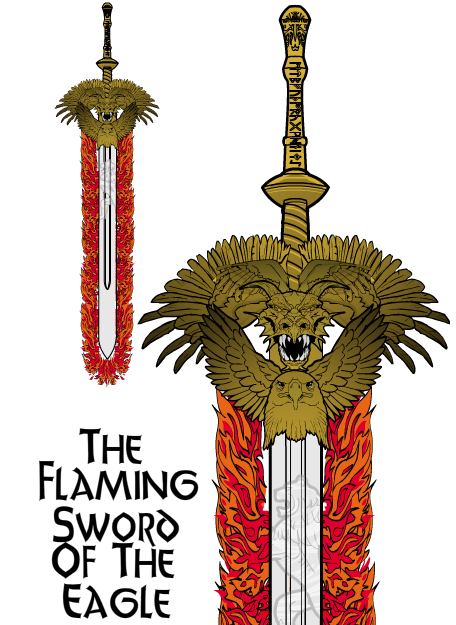 Fyzza's "The Flaming Sword of the Eagle" shows a real nice sense of beauty and design. I love the gryphon engraving on the blade and the way the wings form the crossguards. I do wish the flames had been a little better laid out, but maybe that's more my fault for not putting a better set in there! A very harmonious and cool looking design, though. 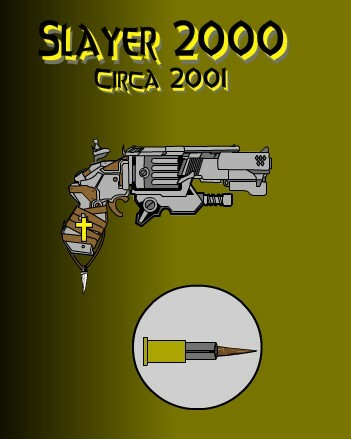 Gene has several designs in the Finalists this week, including this really spooky "Witchslayer". 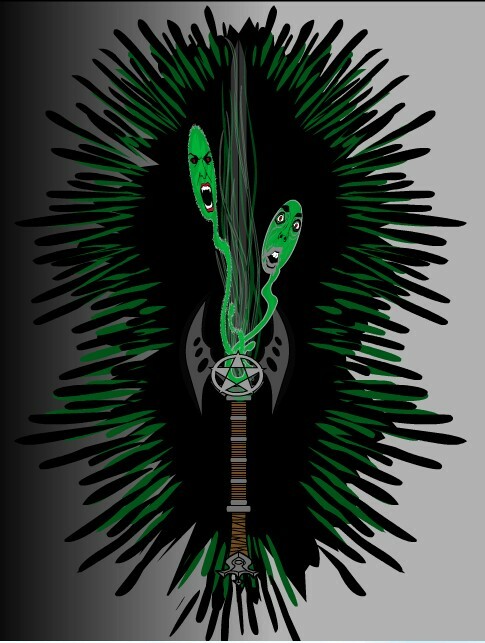 I like the smoky ethereal look of the blade, and the pentagram & axe blade hilt, but what I really love are the spirit faces smoking out of the center. That's just cool. Hammerknight's "Angel's Wrath" also uses the wings as crossguard technique to great effect. This looks like a true named blade and something you'd be impressed to find in your dungeon crawl. "Sword of Vengeance" by Jack Zegler makes great use of masking and patterning to get a nifty see-through effect showing trapped souls. I'm not as crazy about the hand guard, but the overall impact works great. Kaldath brings it every week, and this time is no exception. I love how the flames of his "Flame Sword" really look like fire. Making the hilt out of what I think is a glove is also pretty cool. Overall this is a very simple but effective treatment making a truly believable weapon. 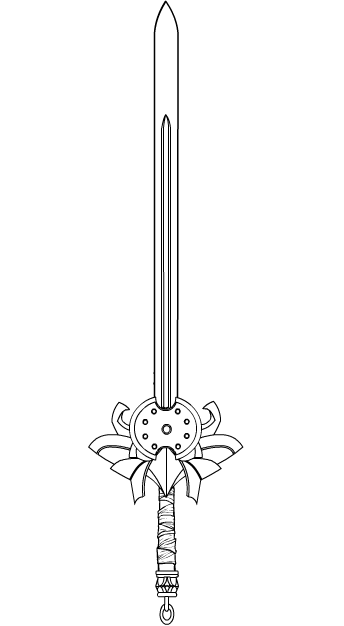 This is what Thundar's sun sword should look like! Martian Blue broke the sword trend with his "Dragon Axe", which sports a fairly amazing array of small, powerful enhancements. I love the dragon foot holding the pommel stone, it fits so well with the dragon head at the top. I also like the holes and the subtle patterning in the twin axe blades. My only reservation with the entire piece is, strangely, how thick the haft is. It doesn't look like something you could easily hold, and if it's for giant hands then the blades would be really small. Quelsir rounds out our Melee Weapons section with a very cool but simple "Storm Spear". Again, this seems like something I'd like to find in an RPG supplement. It doesn't do anything over the top crazy, but it all works together, from the general design to the coloring. Very tight! 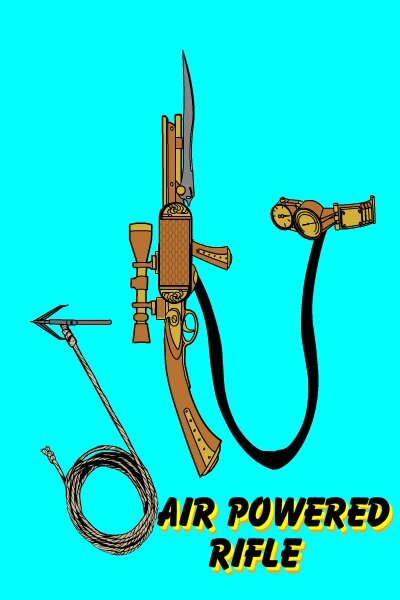 Among Danny Beaty's many entries was this bit of steampunk goodness he describes as an "Air powered rifle". I love the whole effect and the concept, it works great. My only minor quibble is with the hose going from the gun to the compressed air belt, but it's just a really nifty design otherwise. 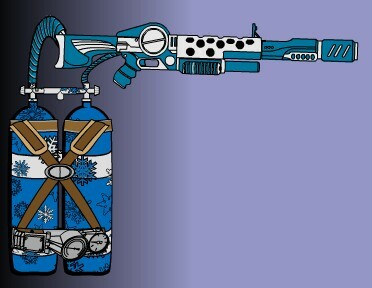 Gene's "Cryo-Cannon" also has a tank and propellant, this time featuring Mister Freeze style cryo gas. Prety nifty. Gene hits the list again with his 1800s style Vampire Slayer gun, firing wooden stakes in a full metal jacket. Which is just all kinds of awesome. He submitted a replacement for it, but I actually prefer this original version. Jordan, after many failed tusslings with Facebook, managed to get his "Thunderbolt Hand Cannon" uploaded, and I'm glad he did. He did a great job combining the disparate elements into a cohesive whole that really looks like it all belongs together. I thought the upside-down grip at the end was particularly clever, conforming to the user's elbow instead of its usual placement in the hand. Nice job Jordan! 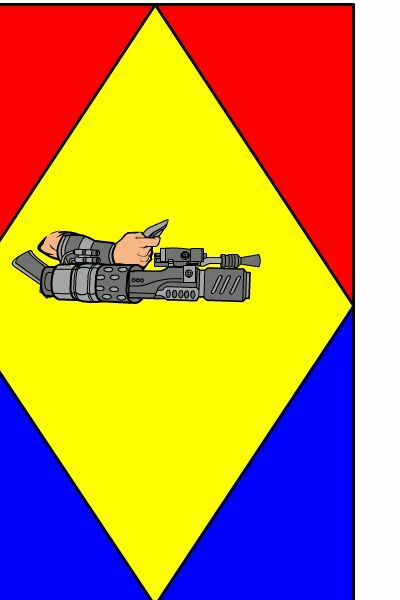 Now we come to the category of weapons that defy easy categorization. 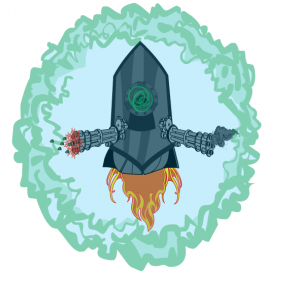 First up is one of my favorite entries overall, Atomic Punk's "Doom Buggy", who I think we can safely assume is some kind of Mirror Universe evil analogue of Herbie the Love Bug. I totally want one. Capshot came up with an intriguing device you strap to your back, only instead of the usual wimpy armrest controls he added gatling guns. Because anything worth doing, is worth overdoing, am I right Mister Bond? I particularly like the bullets flying out of the one gun, that's neat. Martian Blue's hypno-needle gauntlet creeps me out, but in a good way. I think this would be right at home in "Bio-Shock". A very clever and fun invention. 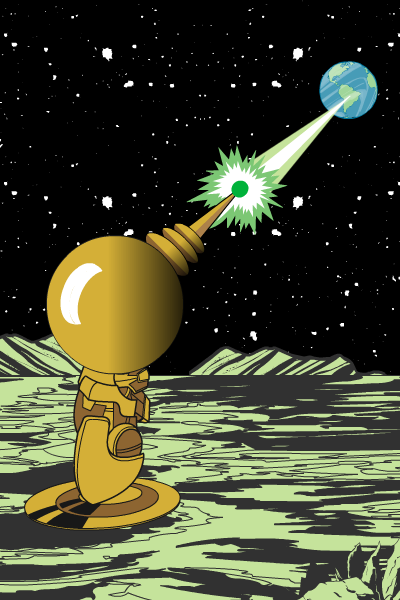 Sol Invictus put together what I think is definitely the best overall "scene" this week, with his massive moon-based "Death Ray", a staple of all good Golden Age sci-fi stories. The details on this one worked out great, I really like everything about it. I do feel bad for those poor bastards in South America, but what can you do? In all great art a few sacrifices must be made. Finally, our winner, someone who took the definition of "weapon" and really twisted it around to previously unimaginable proportions. I confess this made me laugh right out loud when I saw it, and then I immediately wanted to try and build one. Ladies and gentlemen, I give you SpiderCow2010's unforgettable contraption, "The Burler", which achieves its deadliness by flinging angry bears over castle walls to wreak incalculable damage. Whether that's to the bear or the defenders is unclear, but nonetheless you know some demented warlord is totally going to try this. 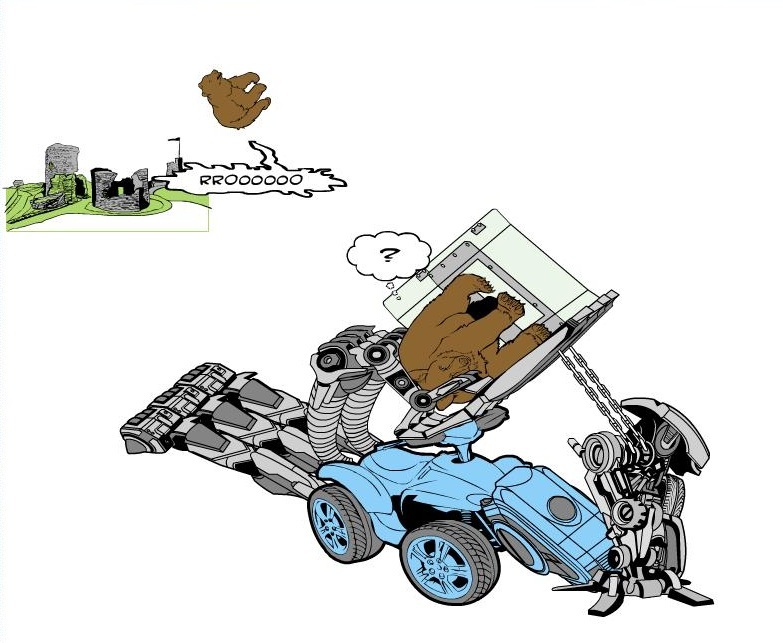 I also like that it's mobile, because bears is tricky fast. The thought balloons really sell it, too. I still am getting a kick out of this thing as I look at it right now. Well done, SpiderCow! Thanks to the many great entries this week, you guys rock! Congratulations not only to SpiderCow2010 but to all the finalists as well. @Jeff: Thanks for the honorable mention! Wow! Three runner up entries! Thanks! Good job all, there’s some great stuff in those entries. That Doom Buggy must go pretty fast with all those Speed Holes. Congratulations SpiderCow, your entry was hilarious. Danny, I like to give the winners time to enjoy their few moments in the spotlight before I send everyone haring off to the next contest. It’ll be a caption contest, as that’s next up in the rotation, and I’ll post it in the next few hours. Thanks Jeff and everybody. Winning was a nice surprise; I was starting to think as I scrolled down that I’d been WAY off the mark (couldn’ta hit it with a bear) or seemed to be dissing the contest or something. Tell you what. I just recently won a contest, so as my prize for this one I’d like you to take the time you would’ve devoted to my prize to tending the 8 or 9 other HM3 irons you’ve got on the fire. Like, say, HM3.5. Or my last prize, the girl-abs. I like girl-abs. btw, need I say Burler is short for Bear Hurler? Was anybody wondering? Oh no, you don’t get off that easy! If you don’t want to claim your actual prize (your abs are still on the list, I do the prizes as time allows, which as people can tell you can be MONTHS sometimes), then you can ask for suggestions from the peanut gallery and pick the one you want. But you gotta name something. Them’s the rules and we LOVE rules! BTW, I totally got Bear Hurler from Burler. It makes perfect sense given the, you know, fundamentally nonsensical nature of a bearapult. 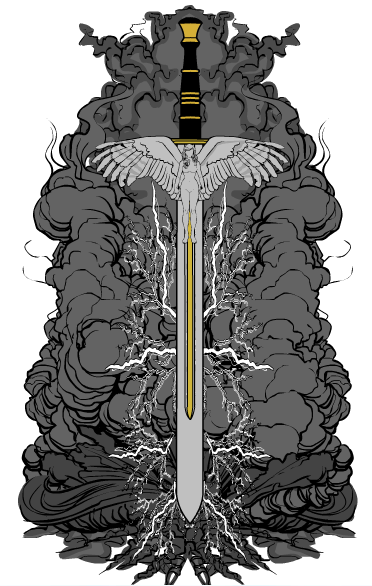 It was based on an old (plastic) sword i got, with an eagle and a dragon at the end on the handle, and the wings forming the crossguards. 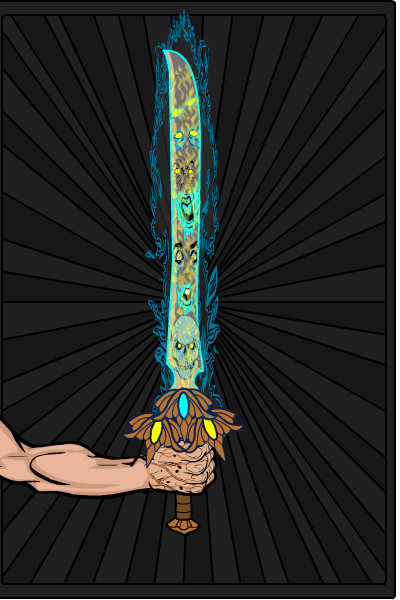 it was a pretty basic sword, so i just added things i thought could make it stand more of a chance of winning. 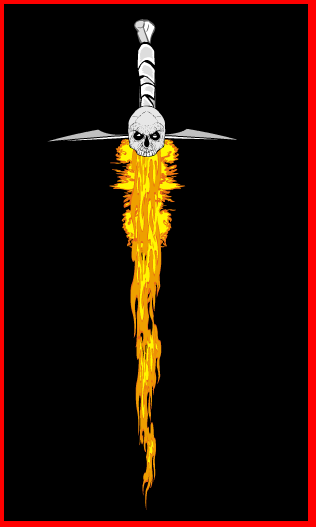 And it’s not really your fault for my flames not being well laid out, beacause i wanted them to stay close to the blade, and i was running out of time to create it, and it was also the second weapon i made on heromachine. This is my first honorable mention. @ Jeff: Thanks so much for the runner-up selection. These contests really are fun. 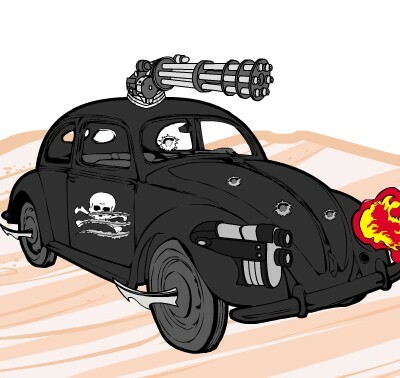 @ Atomic Punk: I love the Doom Buggy. I want one! @ Spidercow2010: Congrats on the big win. Brilliant invention — I could really use one of those in my neck of the woods. I’ve got lots of “ammo”. @Sol Invictus: Love the detail. Right down to the clouds on earth! @Fyzza: I had that sword! It was part of a Halloween costume. @All Edged Weapon Creators: Love them all, especially the blade designs. 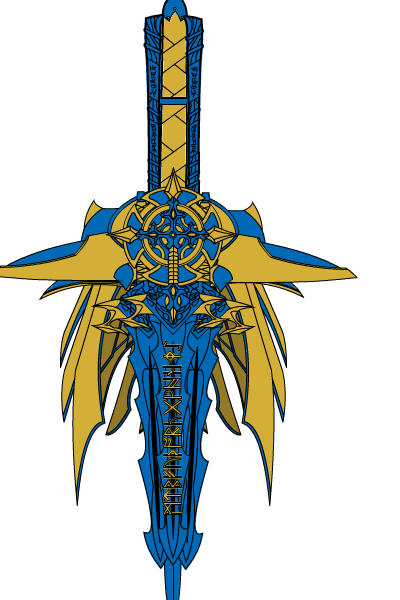 Martian Blue’s Dragon Axe. Dude, get a blacksmith and a producer! I can see that in the next Conan movie. No. Thank you very much for your comments. My first honorable mention and my first creation published here. Again, THANK YOU! @Denise: I can sell you one that won’t work for $500,000,000. Thanks again to all. I’m lovin’ this. Okay, JH, then I’ll pick something. I’d like a city skyline background. Needn’t be recognizable. We have a city street from above and from street level, but no urban wide shot. Especially nice if we can control the colors of the windows and surfaces to get either a city at night or a daytime effect. I mean it needn’t be recognizable as any specific city; probably better if it’s not. You got it, generic city skyline with controllable window colors is on the list. No promises as to speed but it will get done before HM3 launches! Thanks for the honorable mention, Jeff. After being mentioned in the last contest I entered, too, this is only encouraging me to keep entering! Thanks for the double HM Jeff. @Atomic Punk, thanks friend. I’ll probably give it a run over and fix the handle size. Upoon creation I was thinking a battle axe, but I made the handle a bit to large and a bit to short. Just really glad that I got an honorable mention. Its always great to hear what Jeff has to say about something I made. Honestly the shield was more an after thought to go with the story, the blade is where all the work went in. Spidercow your burler is absolutely fantastic. A great idea and wonderful image to go with it, gratz on the win dude. WOW I AM LIKING ALL THEM SWORDS. 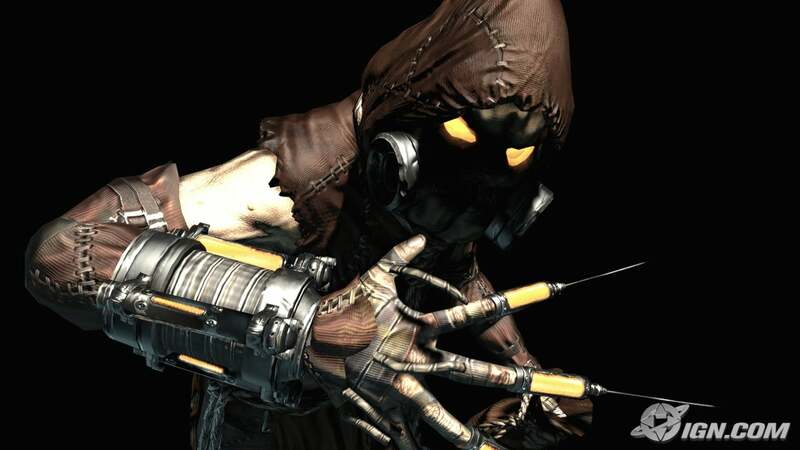 Jeff, if the needle gauntlet creeps you out alone, then you should see it on Scarecrow! Just search “arkham asylum scarecrow” on Google images. Whoops, never mind, Kyle posted the image earlier. All great entries! Martian, may I ask on what you used for the gauntlet?